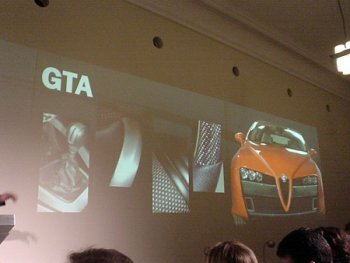 Resulting from a camera phone scoop, taken during an Alfa Romeo branding presentation, we present this exclusive image of what potentially might become the 2007 Alfa Romeo Brera GTA. 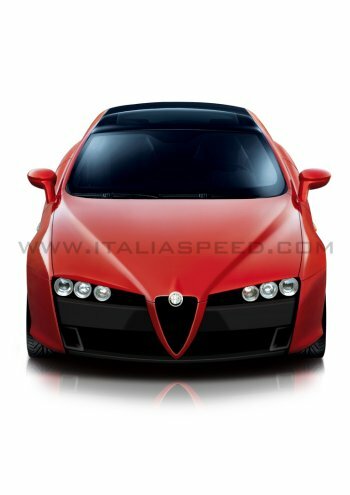 The Alfa Romeo Brera GTA will be the cutting edge flagship model of the Milanese sports car manufacturer when it goes on sale in two years time. The model will not only mark the continuation of the legendary Grand Turismo Allegerita tag, but will be the first Alfa Romeo to spawn technology jointly developed with sister company Maserati. Developed specifically for a new generation of sportscars to be shared on the Brera’s Premium platform, including the future €75.000 Maserati Spyder, the GTA will be powered by a 4.2 litre V8 engine with Multiair delivering 440 bhp and no less than 500 Nm of torque. Not only does will this engine deliver more power than existing Maserati units, it will also be 15% more efficient in fuel economy. For Alfa Romeo, the Brera GTA will represent a technical masterpiece, not only using lightweight materials such as Carbon-fibre and Aluminium, but also with its innovative aerodynamic front spoiler treatment and the possible application of four-wheel steering. As with other models in the Brera range, the GTA will only be available with four-wheel drive. There may also be a wide selection of six-speed transmissions ranging from manual to Selespeed and fully automatic. Exterior differences will focus on a new lightweight bonnet with a lower positioned grille to improve aerodynamics, and a highly revised front bumper bearing exposed Carbon-fibre detailing. In order to cool the optional drilled Brembo CCM brakes, individual cooling ducts will be positioned on either side of the generous air intake. The front spoiler might incorporate an airbrake design, along the principals of new technology which was patented by Centro Ricerche Fiat earlier this year. The Brera GTA’s simplistic weight saving theme is continued in the lack of chrome detailing, with the front grille being a straight-forward pressed mesh affair similar to that presented on the 8C Competizione concept car in 2003. Whereas only frontal details have been made available, it is envisioned that the Brera GTA will come standard with 19 inch horseshoe alloy wheels similar in design to those presented on the 8C Spider concept at Pebble Beach earlier this year. In order to cool the Maserati V8 engine, mesh ducts on the side of the car may also make an appearance. The Sky View roof will be flanked with Carbon-fibre finishing, whereas the rear end will probably see the introduction of a Carbon-fibre diffuser. Inside, the lightweight theme continues, with a Carbon-fibre steering wheel and genuine Aluminium detailing. The Brera GTA package will be launched as a separate model, with a price tag in the region of €70.000. The package will also be available for the Brera Spider, the standard version of which is expected to make its debut at the Bologna Motor Show in December. As of yet, a launch schedule of October 2007 is on the cards for the Brera GTA which potentially ties in with Alfa Romeo’s market return to the USA.